A disc of gems from the quartet literature indeed, but hardly the gems that one would think of with only Puccini’s Crisantemi being a regularly performed work, and even then, it usually features as an encore. Even the Mendelssohn Capriccio, which comes from his Three Pieces Op. 81, is somewhat overshadowed by the composer’s major works for quartet and usually only features in recordings of his complete quartets. I do however have recordings of all these works, if not all performed by a quartet, and I must say that it is good to see recordings of these worthy, but usually neglected works, collected and presented on a single disc. The opening work on the disc is Turina’s La oracion del torero (The bullfighter’s prayer), originally composed for a laud quartet, an instrument resembling a cittern or lute in 1925, it was arranged the following year for string quartet, string orchestra and piano trio. I have a couple of versions: the Nash Ensemble’s fine recording of the string quartet version (CDA67889) and the version for string orchestra. I have always preferred the quartet version. The work, whilst drawing upon folk music, was designed not to be overtly Spanish in character but more international. The work has a Spanish flavour which the Nash’s make more of, whilst the EnAccord Quartet point more to its more international nature, either approach is valid here. The second work is another arrangement for string quartet, this time without the composer’s knowledge. I have enjoyed the recording of Alessandro Scarlatti’s Concerto Grosso that I have, and whilst I also like this arrangement, I am still a little unsure about it, and I think I find the original preferable. Perhaps it is the solo work of the Concerto, there is plenty of scope for that, but there are times that the work is for soloist and string accompaniment and therefore against the idea of the string quartet. I don’t know who arranged the work, but they certainly make use of the four-part writing and harmonics of Scarlatti, with the music being attractive, just not as attractive as the original. With the Guillaume Lekeu we are on firmer ground, with the first work here which was written purely for string quartet, with his Molto Adagio having the subtitle ‘Commentaire sur les paroles du Christ’, taking as its inspiration Christ’s words in the Garden of Gethsemane “My soul is exceeding sorrowful, even unto death”. An unjustly forgotten masterpiece, this single movement piece was the composer’s first venture into the genre but shows a maturity in excess of his tender years. Of my two other recordings the Ensemble Musique Oblique (HMX 2908040) is the longest version at over a minute slower than the EnAccord’s, whilst the Spiegel String Quartet (MDG 644 1266-2) are nearly forty seconds quicker. The Ensemble Musique Oblique are the ones to bring out the ‘doloroso’ aspect of the music most, the Spiegel’s being a little too quick, this new recording ploughs a happy medium, highlighting the anguish of Christ without dragging it out. As stated above, Mendelssohn’s Four Pieces for String Quartet Op. 81 are somewhat overlooked, so it is nice to have one of them presented here, though it would have been nicer yet to have had all four pieces, especially as there is more than enough room on the disc to have accommodated the rest of them. The four pieces were cobbled together after Mendelssohn’s premature death by his publisher and date from different times during his compositional career, the fourth, the Fugue being as early as 1827, whist the Capriccio, presented here, dates from 1843 and could be said to have been a preparatory sketch of ideas for his Violin Concerto composed the following year. Here the EnAccord String Quartet are able to bring out the rich sonorities well as they exploit the harmonic development of the piece. Still it would have been nice to have the other three! One of Puccini’s best known none operatic works, Crisantemi is an elegiac piece composed in a single evening in 1890 in memory of Amadeo di Savoia, with the name referring to the chrysanthemums that are traditionally used at Italian funerals. This short piece contains some lovely thematic material, some of which were later used in Manon Lescaut, with the work pointing to what could have been if Puccini had not concentrated on opera. My favourite of the works presented here, Erwin Schulhoff’s Fünf Stücke für Streichquartett of 1923 is a triumph of modernist ideals, reminiscent of Bartok, Shostakovich and the Second Viennese School. The titles of the individual pieces promise a dance suite, whilst the music delivers something quite different, with the darkly sardonic wit of the composer coming to the fore. The Five Pieces were composed before Schulhoff’s First String Quartet (1924), but despite this they have more in common with the more developed style that he utilised in his Second String Quartet (1925), which is something that the EnAccord String Quartet are quite adept at exploiting. 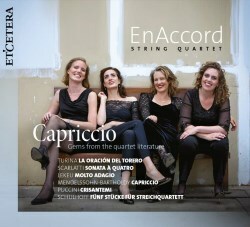 The EnAccord String Quartet are very good throughout; yes, there may be finer recordings of the individual works out there, but as a whole this is an excellent recital of some lesser known and neglected works for string quartet. This is a well thought-out and executed program, one which brings out, through the performance, the best of this music. The recorded sound is also very good as are the well-researched booklet notes. A must for all lovers of the string quartet.